If you have any questions that have not been answered in this help document, or feedback to share, please email contact@condatis.org.uk. Ecosystems are under threat worldwide and habitats are becoming more fragmented. Meanwhile, organisms interact with each other and the environment across long distances and, as the climate changes, will need to move to new sites as their old ones become unsuitable. Sites across a wide area can be thought of as an “ecological network” and to be really effective these networks need to be bigger, better and more joined up. This may require creation of new habitat or restoration of existing sites. Policy makers and nature conservation practitioners are increasingly thinking about conservation and biodiversity at large spatial scales, but continuing development leads to difficult decisions about how to prioritise habitat creation, restoration and even loss. Condatis is a decision support tool to identify the best locations for habitat creation and restoration to enhance existing habitat networks and increase connectivity across landscapes. It achieves this through modelling very long-distance, multi-generation shifts across a fragmented landscape, which species are increasingly embarking on due to pressures created by climate change, amongst other drivers. Condatis achieves these outcomes through performing two types of analyses: flow and dropping. Flow is a measure assigned to each habitat cell that gives an indication of the relative number of individuals moving through that cell that will go on to colonise the target (strictly speaking, their descendants will colonise the target). The larger the flow value of a habitat cell, the more important that cell is for connectivity between the source and the target. Flow of individuals only occurs through habitat cells (defined by the uploaded habitat raster map). Dropping is a method for prioritising patches of habitat for restoration or protection, when the user has a restricted map of feasible areas. The method shows how additional habitat cells can increase the speed of species’ movement across a landscape of existing habitat and can also be used to highlight areas of an existing network that cannot afford to be lost due their contribution to connectivity. In a dropping analysis, habitat cells are ranked according to their contribution to the speed of species’ movement and the lowest-ranking additional cells are ‘dropped’ from the landscape. This procedure is repeated multiple times until only the most important cells remain, contributing the most to flow. Condatis models a landscape of habitats as if it were an electrical circuit. A circuit board consists of a number of wires joining up resistors in combinations. When a voltage is applied to the board at one end, the current will pass through the board to the other end but the amount of current passing through each wire will vary according to the resistances it meets through each pathway. Condatis considers a landscape as analogous to a circuit board (Fig. 1), with a source population of species being considered the voltage, the links between habitat useable by these species being the resistors, and the flow of species colonising the available habitat across those links being considered the current. A full description of the underlying scientific method can be found in Hodgson et al. (2011) and Hodgson et al. (2012). Fig. 1 Electrical circuit on the left and comparable stylised habitat map on the right. 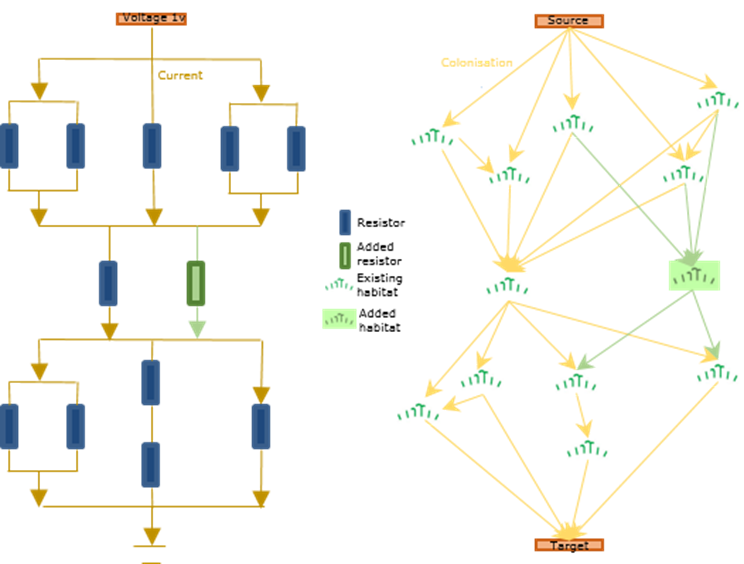 Green represents adding a resistor or additional habitat to each to increase the number of pathways available and therefore improve the flow. The key output of Condatis is a measure of flow (Fig. 2). Fig. 2 An illustration of flow and some of the main variables modelled in a Condatis analysis. Condatis is a highly flexible and very powerful tool designed for landscape scale studies of connectivity over successive generations of species. It works particularly well for habitats that are well-defined and patchy. However, if the area of interest is likely to be very small (roughly the distance required to colonise habitat within one generation of a target species) then Condatis is unlikely to produce results that will be meaningful. If however you are looking for a quick and easy to use application to look at directional connectivity over a landscape, pick out the most effective sites for habitat creation or restoration, test climate change resilience or run a number of directly comparable colonisation scenarios then we would recommend trying Condatis. The decision tree below (Fig. 1) can be used to further assess whether a Condatis analysis, and which type, is appropriate for your connectivity questions. 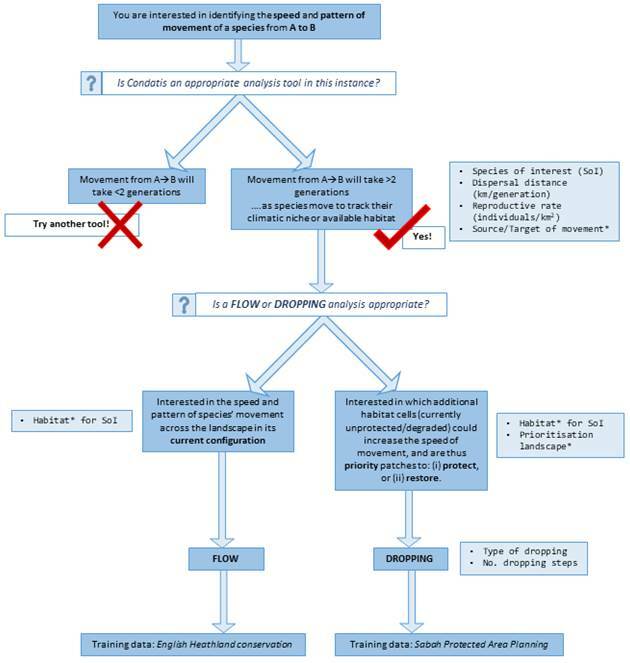 Before using Condatis, the decision tree below (Fig. 3) will help you to identify which type of analysis is most appropriate for the connectivity questions you have. Fig. 3 Decision tree to work through before you perform a Condatis analysis. Data types and decisions required for performing a Condatis analysis are shown in the pale blue boxes; * indicates raster files (in geoTIFF format). For information on how to generate raster files, see Section 4. (i) What kind of species are you interested in? (ii) Why do your species need to move between the focal source(s) and target(s)? (iii) What constitutes habitat for those species within the landscape, e.g. native forest? (v) If yes, how will you classify the landscape into baseline habitat (that you assume will not change in future) and the prioritisation layer (which may or may not be habitat in future)? (vi) Who will be interested in the results, i.e. target audience? Why? 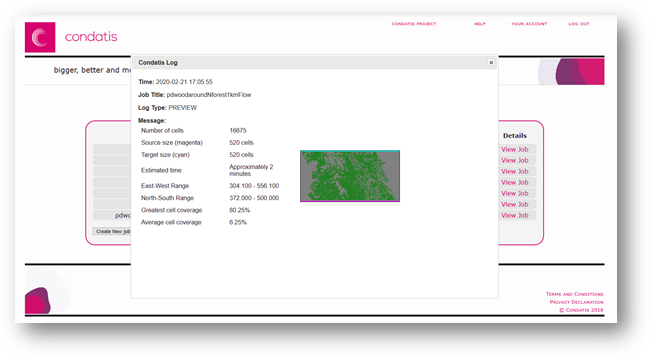 Considering the answers to these questions will help to make your Condatis analysis most useful for understanding future movement patterns of wildlife and guiding more sustainable land management decisions on the ground. For an example of answers to these questions for a specific case study, see Section 2iii and 2iv. Condatis web version 1.0 can be accessed here. In order to use Condatis, you will need a laptop/desktop computer with access to the internet. Condatis will work on any browser, and requires you to create a personal account before you can access the tool. If you have any difficulties registering for an account, please email contact@condatis.org.uk. For more information on this decision support tool, its origin and the Condatis projects currently underway, please have a look at our website. If you do not have your own data to run, you can access some pre-prepared training data on the Downloads page of the website, which forms the case studies used below to illustrate the tool. The data layers/values that are required for running a Condatis analysis are shown below, along with a brief description of how to create each input. Section 4 contains detailed guidance on how to create the input raster layers. When performing a Dropping analysis, in addition to needing the Flow input parameters (the first four parameters below), a Prioritisation input layer and decisions on the numbers and type of stages of dropping to perform are also required. Similarly, the Flow outputs are generated in a Dropping analysis, with the addition of dropping-specific figures, as illustrated in Section 3. Derived from ground data/expert knowledge, or based on a general rate to replicate slow, medium and fast reproducers. As a rule of thumb 10 or less will show movement of low fecundity species, 100 or more high fecundity species. This is effectively the number of emigrants leaving 1km² of suitable habitat every generation. As the speed of colonisation (and therefore time taken) is simply multiplied by R, the speed of colonisation for any rate of reproduction can be easily calculated once the initial scenario has been run; measured in individuals per km2. Raster which must be a geographical .tif file, where cells have a value between 0 and 1 (or 0-100%), according to the quantity/quality of habitat within each cell: 0 being empty of habitat, 1 being completely full. Raster which must be a geographical .tif file with the same coordinate system as the Habitat file; source grid cells (pixels) are given a value of ‘1’ and target cells ‘2’. Where cells overlap the habitat cells then the conflicting habitat cells will be automatically removed. Raster which must be a geographical .tif file with the same coordinate system as the Habitat file, which can represent habitat that either: (a) does not currently exist, but where restoration is possible, or (b) does exist but is currently unprotected and therefore may be a priority for conservation. In case (b), as well as preparing the prioritisation layer, you will need to subtract the unprotected habitat from the habitat layer. Choose which number of stages is appropriate given the desired specificity of results (better with more steps) and time available for analysis (slower with more steps). The two options are: (i) Number based (equal number of cells dropped in each stage), or (ii) Flow based (equal proportion of flow dropped in each stage). The number based output may be simpler, for ranking the landscape into broad bands, but the flow based output gives more detail in the high-flow areas, which we think may be more useful when you can only afford to protect/restore a very small proportion of the additional habitat. · Habitat coverage is measured in proportion or percent. Further guidance on how to create the appropriate input layers is provided in Section 4. If you would like to run the same job again, but with slightly modified parameters, you can do this by clicking on the “Create Related” tab in the “View Job” tab of a previously completed job. Input files and parameters will be exactly the same as the viewed job, with the only difference being the (2) suffix on the job title to ease navigation between jobs. The job title and all other components can be modified as required. If you need to delete a job altogether, use the “Delete Job” tab on the same Manage Job page. However, if the job failed, please check with contact@condatis.org.uk before you delete it so that the development team can interrogate the job to find out what might have caused the failure before the evidence is lost! If you have run more than 16 jobs, only the first 16 will be shown on the Job Management page to reduce the requirement for scrolling; if you would like to see an earlier job or count your total number of submissions for example, click the “View All” tab at the bottom of the page. The output/results files from a Condatis analysis are shown below. Figure legends in the results .html file contain descriptions of each output. iii) All raster files are in geoTIFF format, i.e. labelled .tif. A gap between habitat patches that lie on a major path of flow. Adding new habitat in these gaps will improve the flow along the associated path, improving overall flow between the source and target. The ecological proximity between two habitats, i.e. how well connected two habitats are relative to the species travelling between them. How connected two patches of habitat are for an individual depends on the distance between them, the characteristics of the intervening landscape and the ecological characteristics of the individual, e.g. dispersal distance and habitat preference. The average distance one individual can travel in their lifetime; derived from ground data/expert knowledge per species; measured in km. The geographical range of the landscape of interest, defined by coordinates. For Condatis analyses, the extent of an input raster file must be defined in meters. Flow is a measure assigned to each habitat cell that gives an indication of the relative number of individuals moving through that cell that will go on to colonise the target (strictly speaking, their descendants will colonise the target). The larger the flow value of a habitat cell, the more important that cell is for connectivity between the source and the target. Flow of individuals only occurs through habitat cells, defined by the uploaded habitat map. Habitat constitutes a land cover/ecosystem type in which a species is able to survive and breed, thus it contains all of the resources required for the species of interest to obtain shelter, adequate nutrition and opportunities for reproduction. The Habitat layer forms the primary raster file to which the other geospatial layers are matched in a Condatis analysis. The required geospatial input layers, prepared as rasters in .tif format, with the same coordinate system and measured in units of metres, are: (i) Habitat Layer; (ii) Source and Target Layer, and (iii) Prioritisation Layer. Each layer consists of a grid of habitat cells (see below); what constitutes “habitat” is dependent on the taxa chosen for the analysis, e.g. within the same landscape the grid of habitat cells for a termite and a chimpanzee may have quite a different configuration. A habitat cell is a grid square or pixel within the raster input layers. 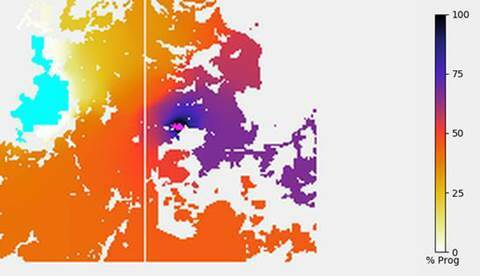 The value given to each cell is equivalent to the coverage of habitat within that cell (between 0-1 or 0-100%). Cells with no habitat may be coded as 0 or ‘nodata’. The number of habitat cells in the raster affects the time it takes for the Condatis analysis to run: for example, analyses for habitats of up to approximately 20,000 cells can be quickly calculated, whereas if there are many more than 50,000 cells in a flow analysis it will slow down significantly, or may prove computationally impossible for a dropping analysis. Locations where new patches of habitat are created, usually through the process of restoration of degraded habitat. An analysis performed in Condatis, i.e. a flow or dropping analysis performed in the online version of the tool, defined by a specific set of input files and variables. The geographical area over which a Condatis analysis is performed, defined by the extent of the Habitat layer. The abundance of habitat patches within the landscape, between which an individual can travel. The minimum spatial unit, i.e. cell, from which a raster layer is comprised. This layer defines either currently unprotected habitat to assess for conservation or non-habitat to assess for restoration. Each cell represents habitat that could be protected/restored to extend the current network of habitat through which the chosen taxa could move. The Prioritisation layer is used in the dropping analysis, to explore which additional habitat could contribute most to increasing flow across the landscape and therefore be important to prioritise in conservation/restoration interventions. Progress provides an indicator of the relative time spent by the species of interest moving across different parts of the landscape from the source to the target habitat. An even distribution of colour indicates that movement across the landscape is relatively uniform, i.e. it takes a similar amount of time to move through each habitat cell between the source and target (illustrated by Fig. A); whereas the dominance of one colour suggests rapid movement through that section of landscape with the bunched colours representing a bottleneck or other features that restrict movement (illustrated by Fig. B), where 50% of the total Progress of the source-to-target movement is not achieved until approximately 75% of the linear distance has been crossed). Fig. A & B Two example Progress reports from the Condatis web version. The source is shown in blue, the target in pink and the main channel of movement is delineated by the black arrow; lighter colours represent proximity of the species of interest to the source habitat and darker colours proximity to the target, with values reported as a percentage of the total movement across the landscape. The directional, long-term movement of the habitat of a population, often driven by climatic changes that cause the previous geographical range of a population no longer ecologically suitable. This represents the average number of individuals produced per generation per km2 of habitat for the species of interest. It is derived from ground data/expert knowledge. The spatial definition of the geospatial data layers, defined by the size of the pixels within a raster layer. An activity performed by humans with the goal of rehabilitating degraded habitat to a former quality/quantity. The source is chosen by the user and represents the start-point of population movement for the modelled species moving to the desired target. Sources are patches of habitat that were of suitable biophysical composition and size to accommodate the modelled species/taxonomic group before dispersal, at which point the habitat is no longer suitable forcing populations to move towards the target(s). The assumption is that movement between source and target will be necessary as the source becomes climatically unsuitable, e.g. too hot and/or too dry. This is a measure of overall or total flow, i.e. successful movement of a species/taxonomic group from the source to the target. The faster the speed, the shorter the time taken to reach the target, measured in units analogous to generations of individuals. The speed reflects the time taken (in relative units) for the fastest individual to move between any source cell and any target cell (not necessarily colonisation of the whole target area or movement of the whole population). If the landscape configuration changes and/or the species being modelled changes, the speed will change. For example, if a species has a shorter dispersal distance, or produces fewer individuals per km2 per generation, all movement through the landscape will be slower. Landscape configuration can also have a large impact on speed (see Hodgson et al., 2016 for more information on this). Speed is a relative measure that can be compared across scenarios computed by Condatis. The user only needs to consider this parameter in a dropping analysis. Habitat cells within the Restoration Opportunity Layer are removed using the chosen number of stages, each one corresponding to a stage of ‘dropping’. If more stages are included, the analysis takes longer because it is repeated for each stage; however, the user is able to differentiate more between habitat cells in terms of their contribution to overall speed, rather than large ‘chunks’ of cells all having the same contribution. The options for the number of stages to perform are: the maximum of one cell dropped at a time, 1000 stages, 100, 50 and 10 stages. The recommended number of stages is 100, as a compromise between spatial resolution and time taken for the analysis to run. The options provided for “Stage Type” in the web version of Condatis are: (i) Number based (equal number of cells dropped in each stage), or (ii) Flow based (equal proportion of flow dropped in each stage). The number based output may be simpler, for ranking the landscape into broad bands, but the flow based output gives more detail in the high-flow areas, which we think may be more useful when you can only afford to protect/restore a very small proportion of the additional habitat. 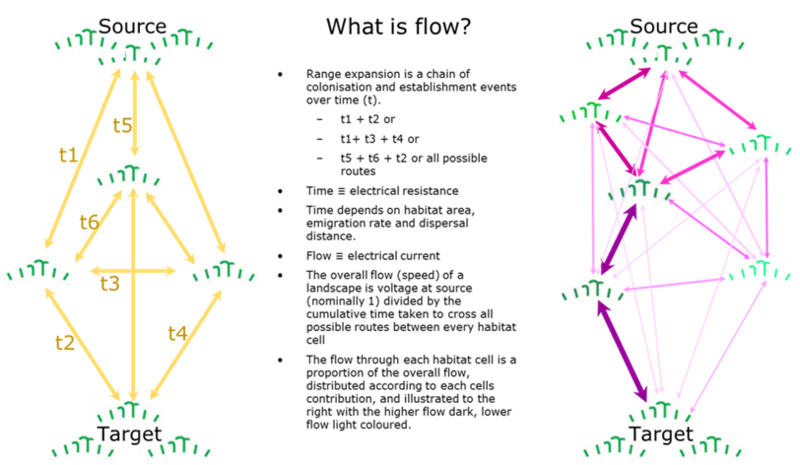 The target is chosen by the user and represents the desired end-point of population movement for the modelled species moving from the source. Targets are patches of habitat of suitable biophysical composition, size, and in some cases predicted future climate, for the modelled species/taxonomic group. When considering the future movement of species under climate change (one of the primary applications of Condatis), the target could be an area which will have the same climatic conditions in the future that are found currently in the source, according to available climate models. The assumption is that movement between source and target will be necessary as the source becomes climatically unsuitable, e.g. too hot and/or too dry. A relative measure of time, reported in units analogous to generations of individuals. The text of this report is copyright Condatis team 2018. The report is intended for the use of the registered user and his or her immediate colleagues. If you wish to disseminate the report or any extract of the text more widely, please seek written permission by emailing contact@condatis.org.uk. For preferred citation formats, please refer to our website. Most recent publication of the underlying scientific method: Hodgson, J. A., Wallis, D. W., Krishna, R., & Cornell, S. J. (2016). How to manipulate landscapes to improve the potential for range expansion. Methods in Ecology and Evolution, 7(12), 1558-1566. Doi:10.1111/2041-210X.12614.